Sooooo, I've been quiet here for a looooong time. Soooo long that I guess I want to add extra ooooooo's in every word. I do have a reason. About a year ago I decided to get serious about something I've wanted to do for a very long time, which is to write a novel. So when I have free time, my writing energy goes toward that instead of here. At this point I have novel that's being polished up and a fancy editor that's waiting to check it out early next year. I'm hoping to publish it sometime next spring. Anyway, I'm starting a website under my pen name and will be updating that with fun stuff. I'm writing under the pen name JA Andrews and since it's more for my writing, I won't be throwing info about my kids up quite as often. I'm sure they'll show up sometimes, because they're hilarious, but not all the time. So, if you're interested in getting emails about once a week from me of the same sort of stuff I usually post here, send me an email (or just reply to this if you get it in an email) and let me know. I'll add you to the list. I won't send many emails. One a week IF I'm on top of things. And I'll let people know when I get my book up and running. Thanks everyone, and hope you're all doing great! 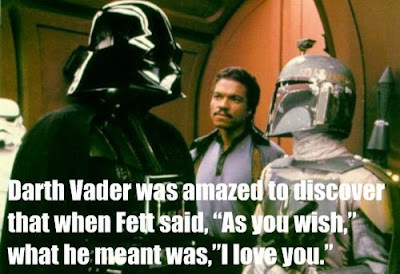 For those of you who love Star Wars and The Princess Bride, this made me laugh and laugh and laugh. NOTE: After declaring in March (!) that I was reviving the blog I wrote a couple posts, then forgot to post them. That means that now they are MONTHS old. As Supreme Ruler of this blog, I've decided to publish them anyway. Liam has decided he likes chicken. This is big. Liam has, since he began solid foods, been a strict vegetarian. Which is a problem because I'm not. And I cook the food. And I cook a lot of chicken. Who doesn't like chicken? Well, I'll tell you who. A kid who ALSO doesn't like anything that anyone would say tastes like chicken. Honestly, it's easier to tell you what he does like. Me: Liam, what food do you like? Liam (looking at me solemnly with HUGE brown eyes): I like LOTS of food, mommy. I like donuts, red Doritos and Fruit by the Foot. Me: Yes, that is a lot of food. And healthy to boot. This has nothing to do with what I'm writing, but it cracks me up. BUT, this week he decided he liked chicken. Definite High. Oh, and yesterday he almost got in trouble, then to smooth things over, he looked at me with those enormous brown eyes and said, "Mom, you are the BEST! You are the BEST COOKER! The best CHICKEN COOKER!" Here he even clasped his hands rapturously, "Which I love! Because I LOVE to eat CHICKEN!" Belle dressed up like Cinderella to go to see the movie Cinderella. It was awesome. I love that kid. I grabbed a little knit owl hat at the checkout counter of a local thrift store for $1. Liam has worn it almost non-stop since. He even sleeps in it. This picture makes me laugh. And cringe a little at the idea of broken, twisted legs. But mostly laugh. This one in particular is out-of-date because the mammoth dog has gone to live with a family who has a hobby farm and other animals and all sorts of outdoor activity that he can participate in. Seeing as he was utterly uninterested in playing with children, he was bored at our house and now he has other animals to pretend he's in charge of. So the dog is happier and I get to breeze past the enormous-bags-of-dog-food aisle at Costco with nary a glance into it. Win-win. It's been too long since I posted Highs and Lows. I haven't started swearing like a Brit, this low is actually bloody. Side note: I'm not British. My knowledge of British culture is from tv and movies. As far as I know, Britain is made of up Downton Abbey, MI6, and the Duchess of Cambridge. That being said, I have no idea of the severity of the word 'bloody'. Am I Brit-swearing like a sailor? Or is it the equivalent of 'crap'? I expect an answer in the comment section from my two British readers - Tanya and Kristin. SO, the Low: My dog had a nose bleed. What caused it? No one knows. Maybe. He showed no other signs of trauma and let me jab him in the muzzle without doing anything. (This is pretty normal, the not doing anything. Because he's like Eeyore.) So I'm skeptical, but there are horses next door. Regardless of what caused it, I went out after lunch one fine day to check the mail and there was blood everywhere. This is not an exaggeration. All over the driveway, on the front steps and on the garage floor. And one look at the dog revealed two big, black, bleeding nostrils. It was like the set from a horror movie. You know those scenes where some homicide detectives are discussing blood splatter patterns? I just kept wondering what they would make of this. Would they get 'Newfoundland with a nosebleed and a tendency to shake his head'? I hooked the bleeder up in the grass so I could scrub blood off my driveway and front steps. But later - still bleeding! This is when I chatted with the vet. She asked questions and said, "That's strange...kicked by a horse?...both nostrils? Odd...wait 'til tomorrow and see." So I did. Then it got to be late evening, and STILL BLEEDING. At this point we realized it could be a sign of heat stroke and, since he's basically a yeti, the 60 degree weather might be killing him. So we got out the doggie trimmers and tried to trim off his thick, thick winter wool. But he has as much surface area as the state of Connecticut. Connecticut with a fur coat so thick it would make a polar bear jealous. And he was droopy and sad - even for him. So we just trimmed his back (poorly, because we were losing the daylight) and put him in the grass for the night, since I didn't want a repeat of the blood-on-the-driveway incident. There he was, a droopy, half-trimmed, nose-bleeding, black yeti. The dog had gotten himself free from his constraints and was lying on the back porch against the door. And the blood was just everywhere. Because he was STILL BLEEDING. We have a big porch. It's multileveled. And I swear he had dripped on every single inch of it. This prompted a discussion with my husband about just how much blood a yeti can lose before it becomes a problem. My feeling is that you have to be getting close at TWENTY HOURS of nosebleed. With that Medman ducked out the door to work. It's possible he's never been so happy to go to work. What came next was an hour-long, grizzly version of a Cinderella scene. Not the go to the ball and dance with the prince part. The scrubbing on hands and knees with a scrub brush and a bucket of bleach water part. Except I swear Cinderella's animals helped her. They sewed her a dress and freed her from a tower. My animal was impersonating Jackson Pollock. With blood. From his nose. On my porch. The details--I can't even talk about. Suffice it to say that this was among the most gruesome hours of my life. I finished cleaning the porch, took a shower with the hot water set to "sterilize", got the kids dressed and went out to decide whether to try to get the 130lbs of bleeding, dead-weight up into my van and to the vet or just leave him to sail across the river Styx in peace. When I went outside--NO blood. None. Just a happy dog shoving his drooly head at me and wanting to be scratched. And wanting to chase deer. The official theory is that he ate a mouse that had been poisoned by rat poison, which has blood thinner in it. My personal theory is that he stopped bleeding because he ran out of blood, but his brain works so slowly he hasn't realized yet that this is a problem. I miss my blog. And funny things keep happening. I miss writing down those crazy/stupid/disgusting/funny things that I DON'T WANT TO FORGET but always do. Because it's easy to forget the funny part of life. Studies have shown that forgetting about the funny leads to early onset cantankerousness. So, I'm reviving the blog. Hopefully to write semi-regularly again, but I know myself well enough to know that I'm not promising anything. Meanwhile, here are the funny things that popped into my head which I don't want to forget. Funny Thing #1. My kids are loving Eye of the Tiger right now. I have no idea why my husband decided to play it one day, but they are in love. They beg to hear it all the time. As well they should. Liam loves to tell us about "things you've never seen". Usually this is true because he tells us about things that are absolute nonsense. So, while we're jamming to Eye of the Tiger he says with his usual passion, "I LOVE this song! I do! I LOVE it! And there's another song you've never seen! It's called the F of the Dragon." It took me a couple seconds to figure out what mental path his three year old mind had toddled down to get to from Eye of the Tiger to F of the Dragon, but when I did, I laughed hard. Funny Thing #2. We got a dog. He's the size of a small bear and if you're wondering what he's like, he is a hairy, drool-y Eeyore. The funny thing about the dog is that he refuses to do u-turns. Refuses. He'll walk into the kitchen, nose around looking for scraps - which of course he doesn't find due to my exceptional house cleaning practices - then, to leave he backs out. Even if he's turned himself so far around so he's almost facing the exit, he turns himself BACK around and drops it into reverse to leave. We make loud beeping noises while he does it because he's such slow, lumbering thing. I really want to call him short bus, but I feel as though that is derogatory to all the sweet children who ride short busses. He's just like some sort of old folks home van driven by a geriatric patient who does 16-point turns to get the van out of a parking space at Walmart. For instance, to get to our garage you go downstairs then u-turn to the right. The dog has been known to go down the stairs, turn left and wait patiently until someone opens up the garage door so he can back himself out. I feel as though I should get him rearview mirrors. Funny Thing #3. Not funny, but makes me happy: It's March which means open burn season here. That means we get to collect the vast amounts of wood laying around in our, well, woods, and BURN it! I love fires. And I love when it's drizzly so the kids all throw on their cowboy hats. Even my little girl who was sick so bundled up against the drizzle. I love how everyone's hair smells like campfire for the rest of the day. I have to say I don't feel as though this post really lives up to the funny post I feel like it should, but I'm rusty. And I'm happy to know that now that I'm writing again, my little brain will cling to those funny things until I can write them down. Ok, this is another post about Liam. I blog because I remember the parts of my kids tiny years that I blog about better than the parts I don't. And my blog is always heavily weighted toward the kid who's about 2 or 3 years old. 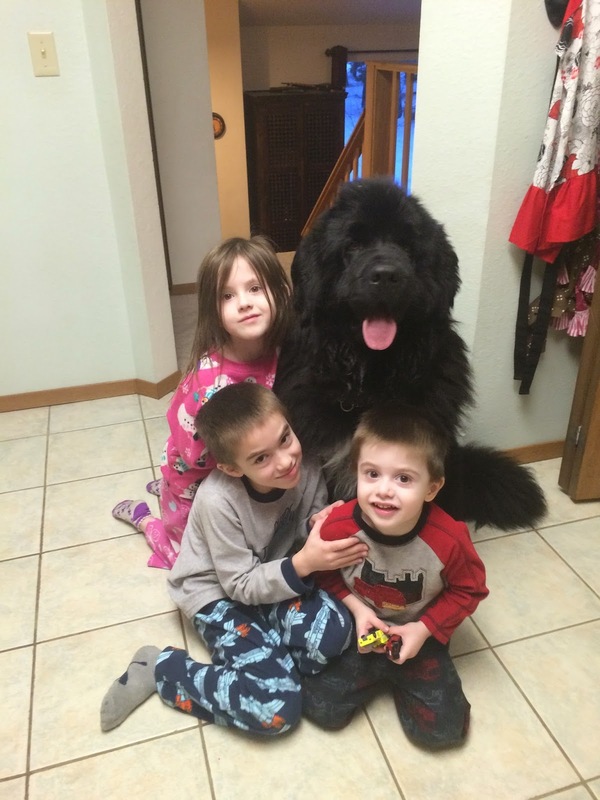 So I realize the blog is Liam-heavy lately, but he's two. And two-year-olds are hilarious. They get a bad rep, but that's just because they are passionate. About EVERYTHING. See? 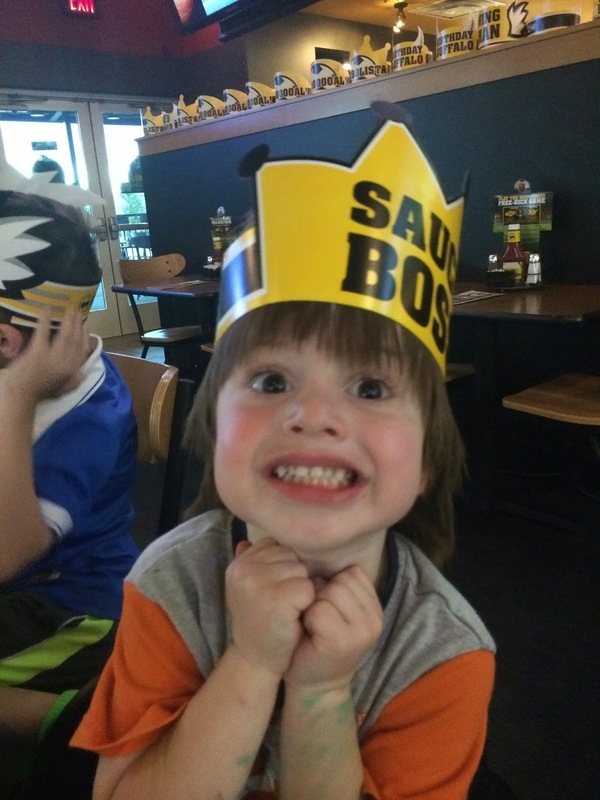 Passionate about his "Sauce Boss" crown. And it's easy to remember how passionate they are about not getting that toy they want. But they're also passionate about funniness, and wonder, and encouragement, and kindness. "Hey!" He was using that oddly macho-man voice that he uses. It's somewhere between a mafia hit man and a disgruntled, middle-aged, German businessman. "You like khgunk?" He was SO intense and I had SO little idea what he was talking about that I was feeling a bit taken aback. Liam, looking aggravated, "No! KKKUNK!" At this point I'm starting to laugh because it doesn't usually take me this long to figure out what he's talking about. So I start 20 questions. Me: "Is Kunk a food?" We are standing in the kitchen, after all. Liam, looking at me like I'm stupid: "No." And he gives me nothing more. Me: "Uh... is Kunk a....toy?" He sighed here, as though it was exasperating to have to deal with such an idiot. "No, Mom. Kunk. Smells yucky. A Kunk." Me: "OOOOH! A skunk! I forgot you have something against starting words with 's'! Skunk! No, I don't like skunks. Because they smell yucky." And he grinned at me. "Me no like kunk either." "Glad we had that talk!" I called after him. But he was passionately on to something else. I'm Janice, a thirty-uh-something year old wife and mother of the three cutest children on the planet and of the cutest tiny baby saint in heaven. I like to chat with my husband, Medman, listen to the stories told by my 8-year-old son, Dalton, die laughing at the humor of my 5-year-old girl, Belle, try to keep tabs on the 3-year-old, Liam, and try to stay home as much as possible. If being a homebody were quantifiable by some chemical in the body, mine would be off the charts. When left to my own devices I like to sew, paint, read and dream of the day when I have nothing but vast open hours to write.